I don't follow Laura Loomer very closely. She is apparently a conservative, politically incorrect commentator. She was recently banned by Twitter. 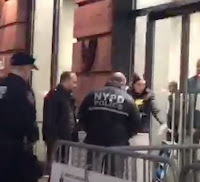 In response, she handcuffed herself to Twitter's front door in New York City to protest her ban and only recently was cut free by New York City police and arrested. I don't agree with Twitter's banning operations. However, as far as I am concerned, Twitter is a private company and should be free to run their business however they choose. That said, as I have previously pointed out, bans don't work (See: Can Ideas Be Blocked?). The establishment will always try to silence the outliers but it doesn't work. They fail to understand the true and deep nature of second-hand dealers in ideas, which was outlined by Hayek. 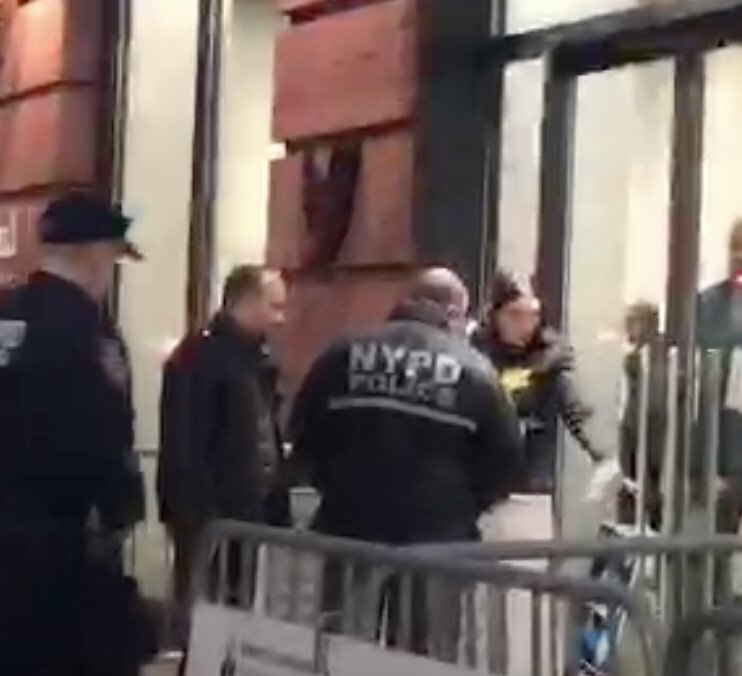 NYPD says Laura Loomer hasn't been arrested over her Twitter protest, although she did go "voluntarily" to a police station. Twitter declining to press charges seems key here — NYPD spokesman says "you need a complainant to have an arrest." Yes, another 'private' company whose owners enjoy legal protections via government decree. Laura Loomer hates free speech, so long as she's free to cheer for Israeli border walls. She was instrumental in getting the alt-right thrown off the app Discord. It's nice to she's getting a taste of her own gefilte medicine. Don't worry Wenzel, this site still has at least until the end of the year, but rest assured your day is coming as well. But you're always free to build your own internet. New technology that distributes communication seems to have historically favored individual freedom. This is not good for those in established power so they try to control it to their best ability. As new technology becomes established technology it becomes more controlled by established power. The established power may have been altered by the new technology but once a person becomes part of the establishment they typically will want to control communication technology to keep their power. We see this in the history of the printed word especially in journalism. Nationwide broadcasting seems to have been controlled by established powers from the start. So now the wild west of the internet is coming under more control of the establishment. Will it follow in the footsteps to establishment control like print and broadcasting? Yes and it could be worse due to the nature of distribution of information through the internet. What once would have been a local newspaper or radio show or an obscure periodical received by snail mail is now distributed on a world wide web. Nobody wants to go backward. We want it all and we want it now. New technology will be the answer. Technological change has become very rapid. It will not be centuries or even decades as it was between the printing press and radio or television and the internet. There are already solutions in the works to establishment takeover of the internet as we know it. Wireless Mesh Networking is an example. Can the internet be controlled 100% without complete marshal law or even to a large percent without the tyrannical control we see in China? That’s not going to go over in the west. If sights such as this one were not allowed to transmit there would be an uproar. Social media is a different animal. It is 100% reliant on online media. Scott Horton was temporarily banded by Twitter and then just quit using it with little effect on his audience. If ISP’s stopped allowing his podcasts his audience would be effected enormously and take that out on the ISP’s. I don’t see social media bans resulting in much unrest. There are alternatives to Twitter, Facebook and YouTube. Alex Jones is the biggest hitter to be banned by social media. He still has his websites. The question is, what would happen if those sites were blocked? Would enough people cry freedom of speech? At the time Horton was banned from Twitter so was Daniel McAdams and Peter Van Buren. Van Buren had an interesting observation. Twitter gave the same platform to nobodies as it does to somebodies. He used an example of himself being able to comment on a tweet by a reporter form the NYT. His point was the importance of being able to interject a different perspective to the same audience as the NYT. While there are social media alternatives part of the good thing about the big market outlets was this equal access for differing opinion resulting in alternative opinions being accessible to everyone on one platform. Having different platforms for different viewpoints is less productive, especially for us minority.